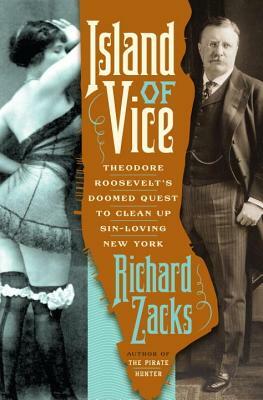 I just finished reading Island of Vice: Theodore Roosevelt's Doomed Quest to Clean Up Sin-Loving New York, and it's fantastic (stay tuned for review). Especially if you have a bit of a crush on histories of New York, which I do. My six years in New York embedded within me a deep respect for the power of that place, of its neverending capacity to change, and yet harbor within it so much history, so many stories, so many lives. One of my greatest pleasures, as a reader and as an ex-Manhattanite, is diving back into the city I think I know so well only to find a previously undiscovered layer. That is precisely what Island of Vice does: peels back what we think we know about 1890s Manhattan, and Theodore Roosevelt's time there, and instead presents what we should have known. Throughout it, I could not help but draw parallels to that well-loved thriller, The Alienist, which I read early last year and absolutely adored. The two feature many of the same characters (Jacob Riis, Theodore Roosevelt, Big Bill Devery, etc. ), but approach the subjects of vice, police corruption, and TR's time as Police Commissioner from very, very different angles. And yet it is impossible not to see the connections. If you haven't read The Alienist, I strongly recommend it (read my full review here); once you're done, dip into Island of Vice (on sale March 13) for a non-fiction approach. Does anyone else do this as they read? Find connections between stories, histories, whatever the case may be? Any other books on 1890s New York that I should be eyeing for a next read? You might want to check out Murder of the Century by Paul Collins. I love that period too, so I am adding Island of Vice to my wishlist now. Not New York, no, but I definitely found myself drawing parallels when I read Clara and Mr. Tiffany (fiction, 1890's, Chicago), The Devil in the White City (nonfiction, 1890's, Chicago), and Around the World on Two Wheels (nonfiction, similar time period, around the world but yea, Chicago) all around the same time. It improved my experience of reading all three, to feel that world expanding around me. Sounds great!! "The Warmth of a Cold Nose"